Neotison Nasal Spray: After initial priming, each actuation delivers Fluticasone Furoate INN 27.5 micrograms. Neotison (Fluticasone Furoate) is a synthetic, fluorinated corticosteroid with anti-inflammatory activity. It is an aqueous suspension of microfine Fluticasone Furoate for topical administration to the nasal mucosa by means of a metering and atomizing spray pump. It is necessary to prime the pump before first use or after a period of non-use (1 week or more). Each bottle of Neotison nasal spray provides 120 metered sprays. After 120 metered sprays, the amount of Fluticasone Furoate delivered per actuation may not be consistent and the bottle should be discarded. Neotison (Fluticasone Furoate) nasal spray is indicated for the treatment of the symptoms of seasonal and perennial allergic rhinitis in patients aged 2 years and older. Adults & Children over 12 years: 2 sprays in each nostril once a day. In some cases 2 sprays into each nostril twice daily, not exceeding 4 sprays. Children under 12 years (2 - 11 Years): 1 spray in each nostril once a day. 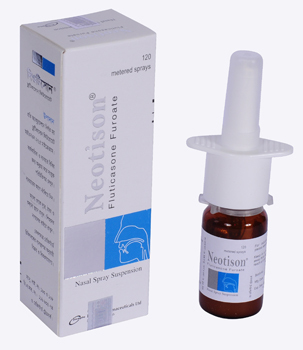 Patients should use Neotison (Fluticasone Furoate) nasal spray at regular intervals as directed since its effectiveness depends on its regular use. Children (under 2 years of age): There are no data to recommend use of Fluticasone Furoate Nasal Spray for the treatment of seasonal or perennial allergic rhinitis in children under 2 years of age. 3. Gently blow the nose to clear the nostrils. o Remove the dust cover. o Gently pull off the nasal applicator. o Wash the applicator and dust cover in warm water. o Shake off the excess water and leave to dry in a normal place. o Avoid to apply additional heat. o Gently push the applicator back on the top of the bottle and re-fix the dust cover. Pregnancy: Plasma Fluticasone Furoate concentrations were typically non-quantifiable and therefore potential for reproductive toxicity is expected to be very low. Lactation: The excretion of Fluticasone Furoate into human breast milk has not been investigated.